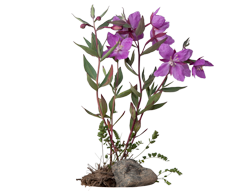 Dwarf Fireweed is a flowering plant that grows in sandy and gravelly moist soil. 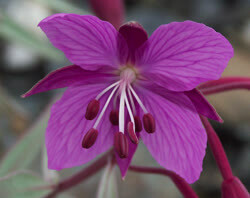 Often found growing along the banks of rivers and streams, this species has the largest flowers of any flowering plant in the Canadian Arctic. It is often called �river beauty�, referring to its abundant purple-pink flowers. The good: This food is a good source of Niacin and Potassium, and a very good source of Dietary Fiber, Vitamin A, Vitamin C, Riboflavin, Iron and Phosphorus. 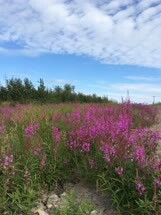 Dwarf fireweed�s parts (leaves, flowers, seed pods) are all edible. They can be eaten raw or mixed with fat, or even mixed with blood and oil. The leaves are good when cooked and taste somewhat like spinach. These plants can also be used to make tea. The tea is good for stomach aches, and to help make a person stronger after they have bled a lot. As well, the leaves can be chewed to help stop a nosebleed. According to several sources, these plants are good for helping with indigestion and general stomach aches. I made tea, as the pot was already containing paunnat plants to brew. I made this brew for a hot drink, so we became cheerful and got talkative.